Filming began on the last day of May 1967, immediately following the Memorial Day holiday (falling on Tuesday in those days, not Mondays). More of the Monkees was still America’s best-selling record album, now in its sixteenth week at the top. On the Billboard singles charts, Aretha Franklin moved to No. 1 with “Respect,” nudging out “Groovin’” by the Young Rascals. CBS was the top-rated network from the night before with Daktari and The Red Skelton Hour. Red’s guests were Ozzie and Harriet Nelson and singer Barbara McNair. In the movie houses, and selling the most tickets (at $1.25 each), was The War Wagon, starring John Wayne and Kirk Douglas. Contrary to being without “scientific validity” Star Trek is the only science fiction show on television with a scientific basis. It is fiction though and it is television, and it does allow the viewer to participate. In fact, it allows the viewer to go beyond even the scope of the writer. Dear Mr. Amory: Don’t feel bad. In the next few days you’re going to get 5,227 letters of protest about your review of Star Trek, mentioning your “total inanity” and “bad puns.” Now there are only 5,226 to go. Amory had since reassessed Star Trek and decided that he liked the series after all. Day 1, Wednesday. 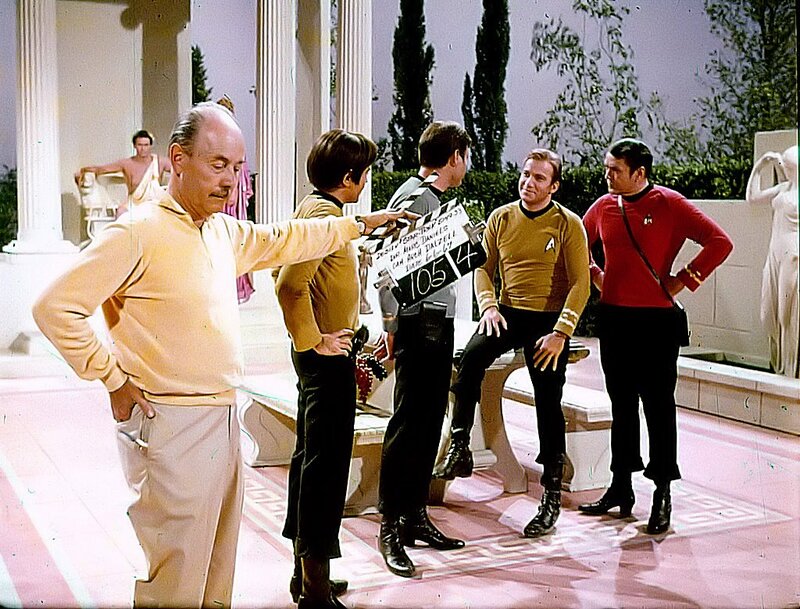 The start of filming for “Who Mourns for Adonais?” was typical of every episode of Star Trek. Fred Phillips and his makeup department had a 6:15 a.m. call time. Both Leonard Nimoy and William Shatner arrived at 6:30; Leonard for his ear job, Shatner for his hair. And Nichelle Nichols was there at 6:30, as well, for her hair and makeup. The second assistant director (2nd A.D.) was there to take breakfast orders. The remaining male players were given an extra half-hour to get to the studio. The camera and lighting crew arrived at 7 a.m. to begin preparing the set. Also reporting to work at 7 a.m. were the property man, sound men, costumers, assistant director, and director Marc Daniels. The sound mixer and camera operator were given a little more time to wake up. Their call time was 7:30 a.m. The entire day was spent on the Stage 9 bridge set. Jerry Finnerman was out sick this first day and replaced by Arch Dalzell. The 45-year-old cinematographer was the D.P. for the1960 cult film Little Shop of Horrors, as well as the television shows The Rebel, Mister Ed, and The Addams Family. The title song for The Addams Family may have told us they’re “creepy” and they’re “spooky,” but the scenes Dalzell lit and shot on the bridge were not quite as shadowy as those done by Finnerman. In the Teaser, note the elevator doors behind Kirk as one example. They are lit both bright and flat, instead of with textured shadow patterns at the top, as Finnerman always did. Leslie Parrish was noticing the lighting, but more so the blinking ones coming from the bridge computers. She said, “That bridge set was pretty awesome. I loved the computers. We didn’t have them then for personal use. But when they came out, I was one of the first to get one. The future has always been much more real to me than the present. Day 2, Thursday, June 1. The Beatles released Sgt. Pepper’s Lonely Hearts Club Band. To no one’s surprise, it was awarded a Gold Record certificate before it even got into the stores. Meanwhile, another full day was spent on the bridge of the Enterprise. Finnerman had returned, bringing his cinematic dark tones and shadows back to the show. 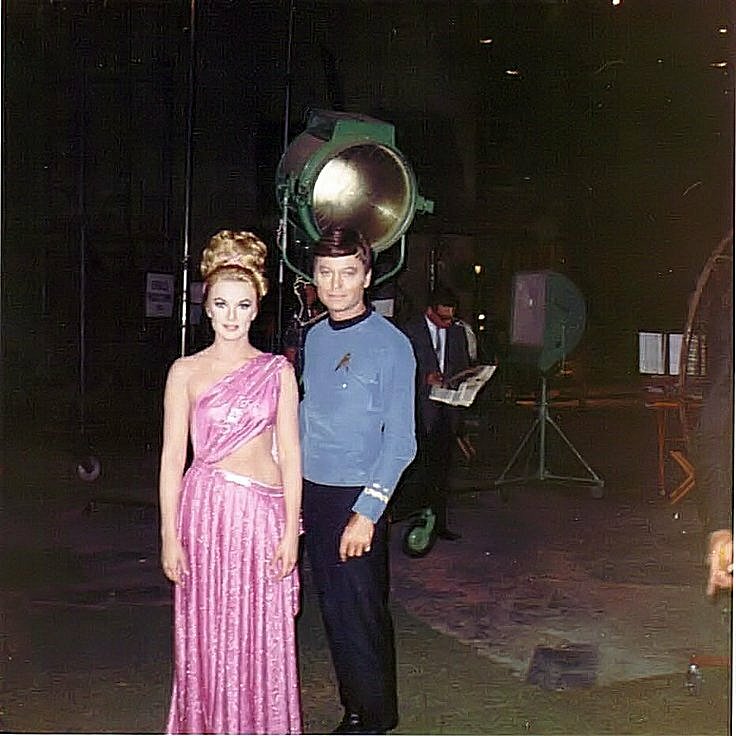 One bridge sequence planned for this day was not filmed -- the episode’s “tag scene.” Writer Gilbert Ralston had been daring in that he ended the story with the discovery that Carolyn Palamas, after her time alone with Apollo on the planet, was now pregnant. The creative staff loved this idea and kept it in the script. NBC’s Jean Messerschmidt was trying to be cooperative with the Star Trek producers; she knew how vital the plot point was. But, as production neared, word of the controversial subject matter began to spread to other departments beyond that of Broadcast Standards. The twist ending, which would have made “Adonais” one of Star Trek’s most talked about episodes for decades, was in every draft of the script, including the 2nd Revised Final Draft, from May 29, 1967. Two days later, as the scene was about to go before the cameras, revised script pages were delivered to cast and crew. The controversial ending had been removed. Even Spock is at a loss for words. Kirk stares back at McCoy, awestruck, as we FADE OUT. The rain was cancelled, saving both time and money. And then set designer Matt Jefferies built as much of Mount Olympus onto Stage 10 as Star Trek’s budget could provide for. 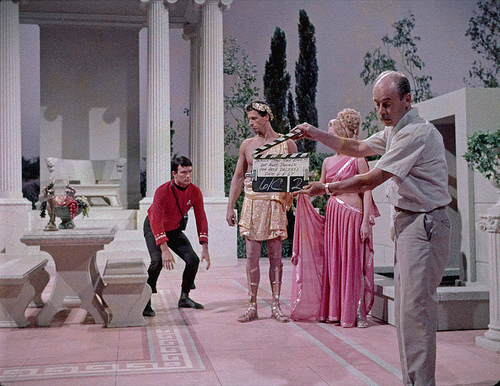 The scenes planned for this third day of production were the landing party’s encounter with Apollo, them reacting to him growing taller for the first time, Apollo changing Carolyn’s uniform for an ancient Greek-era gown, and Scotty getting slapped away when he charges the angry “god.” But Marc Daniels, Star Trek’s fastest director, with a well-earned reputation for staying on schedule and covering an average of ten script pages each day, was falling behind. 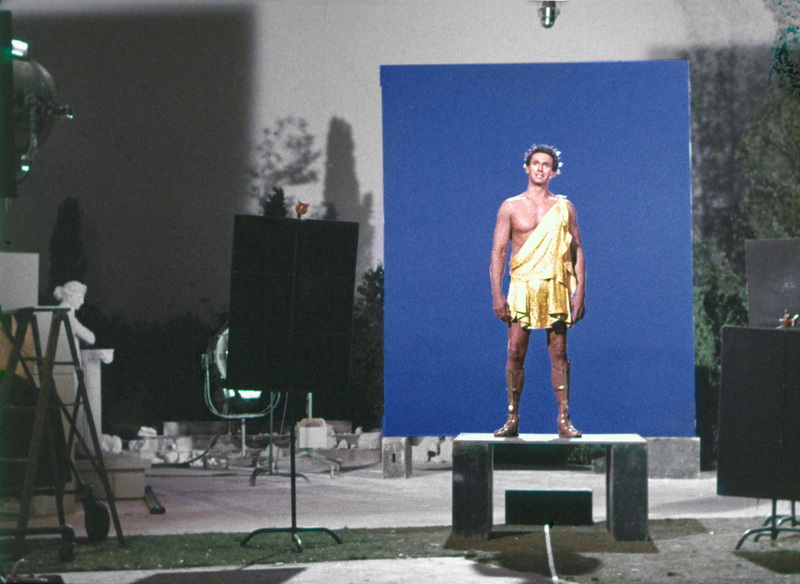 Filming the scenes where Apollo grows to the size of a giant, dwarfing the Enterprise party, and requiring crane shots as well as numerous other camera tricks, was taking longer than anticipated. The slap that would send Scotty flying through the air had to be put off until the next day. Day 4, Monday, June 5. There were some long faces on set this day. The Emmy awards took place over the weekend. 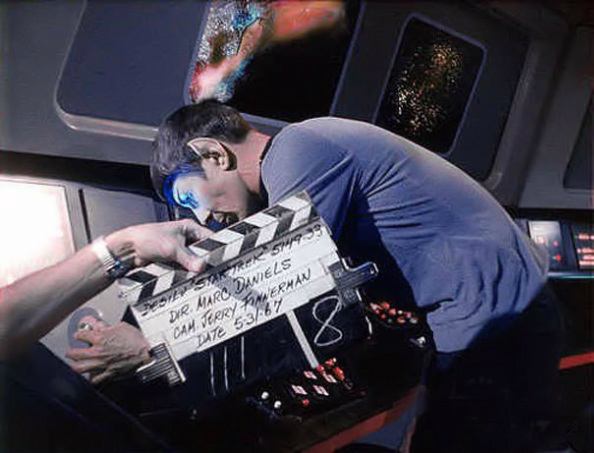 Star Trek, nominated for more Emmys than any other science fiction series in the history of television, including Best Drama Series and Best Supporting Actor (Nimoy), came away empty-handed. You couldn’t sense any disappointment from the cast by watching the scenes shot on this day. When the camera was rolling, the series regulars put aside their disenchantment and rose to the challenge. Director Daniels finished a full half-day behind. Day 5, Tuesday, June 6. After watching the “dailies” of the footage taken the previous day, it was decided the stunt where Jay Jones flew backwards had to be done again. Jones, however, due to his injury, was unable to work. James Doohan was insistent he could do the stunt. After reviewing the two versions of the stunt, it was decided to use the one featuring Jones, after all. Day 6, Wednesday, June 7. Work continued on Stage 10. More dialogue was covered between Kirk and his landing team and Apollo. And then came the dramatic climactic scene where the temple is struck by phaser fire and a distraught Apollo aims energy bolts toward the sky and the orbiting Enterprise. The numerous camera tie-down shots, as animated lightning bolts (to be added during post production) were taken, but turned out to be time consuming. Daniels was three-quarters of a day behind when the camera stopped rolling, well into time-and-a-half overtime pay. Day 7, Thursday, June 8 -- an unplanned day of production. The temple set on Stage 10 had been given a makeover during the night by Matt Jefferies and his team. It was now a charred ruin. 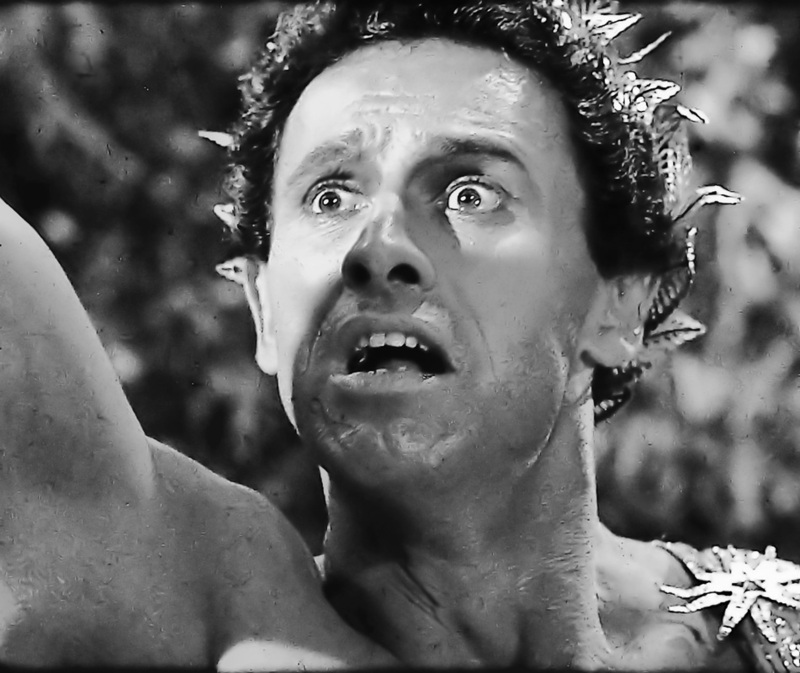 Apollo’s farewell speech was filmed with him “spreading himself to the wind” and vanishing, as Carolyn Palamas weeps. Forest was not aware that starship captains had no hair on their bodies, either. 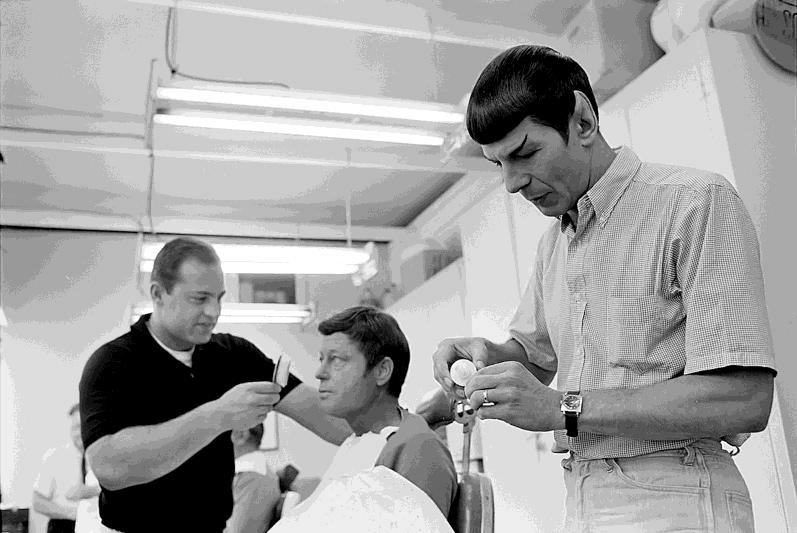 Shatner had first been subjected to the razor, per Roddenberry’s instructions, for “The Corbomite Maneuver” in 1966. At the end of the day, Forest, cleanly shaved, was the only cast member needed. The blue screen shots were taken where Apollo, as a giant, looks down on the landing party personnel, and his disembodied head talks from space, and his disembodied hand grabs the Enterprise. Marc Daniels finally wrapped, one day behind schedule and deep into union overtime. This one, however, had taken seven days. Forest, who had worked six of those seven days, recalled the Star Trek set as being a friendly one. Marc Daniels was “likable and professional,” as were his fellow actors. Time plays tricks on one’s memory. Some things did go sour. And it was actually six days … plus one.